1. Brainy Bike Lights Ltd (“Brainy Bike Lights”) warrants to the original owner this Brainy Bike Lights Bike Symbol Light product (the “Product”) against any defects in materials and workmanship and shall provide warranty services and/or replacements for a period of 12 months, beginning from the date of first purchase by the original owner. If the product is not registered, proof of purchase (such as a copy of the original invoice) is required. 1.2 On receipt of this information, Brainy Bike Lights will provide returns instructions. 1.3 On receipt of Brainy Bike Lights’ instructions, mail the Product to Brainy Bike Lights. 1.4 On receiving the light, if the warranty has not been voided we will investigate the fault. If the fault is fixable we will replace the faulty component and return the unit. If after 5 working days we can’t fix the fault we will send you a new unit or, at our discretion, offer to refund the purchase price. (i) The warranty does not apply to batteries or to any Product that is not installed in compliance with the applicable Product documentation; or (ii) on which the original identification marks have been removed or modified. Further, this warranty does not apply to, and Brainy Bike Lights shall not be liable for: (i) damage resulting from accidental damage (e.g. bicycle accident), negligence or misuse (ii) any defect in, or failure of, the electrical supply to the Product; (iii) any defect of, or caused by, parts not supplied by Brainy Bike Lights; (iv) normal wear and tear resulting from product use and exposure to the elements; (v) modification, adjustment, repair, disassembly or maintenance performed by any party other than Brainy Bike Lights or its approved subcontractors and retailers; or (vi) due to any other cause which does not result from a defect in materials and workmanship. (vii) In the case of the Triangular Symbol Light this warranty is voided if the lithium polymer battery compartment has been opened or an attempt to open it has been made.Brainy Bike Lights does not accept any liability for injuries or other damages resulting from the use of Brainy Bike Lights symbol lights or Brainy Bike Lights rechargeable Triangular Symbol Light. ii. This written warranty is the only warranty made with respect to the Product. Brainy Bike Lights shall not be responsible for loss of the product or for other incidental, special or consequential damages or expenses arising from the product, or for labour or other costs due to installation or removal, or costs of repairs by others, or for any other expense not specifically stated above. 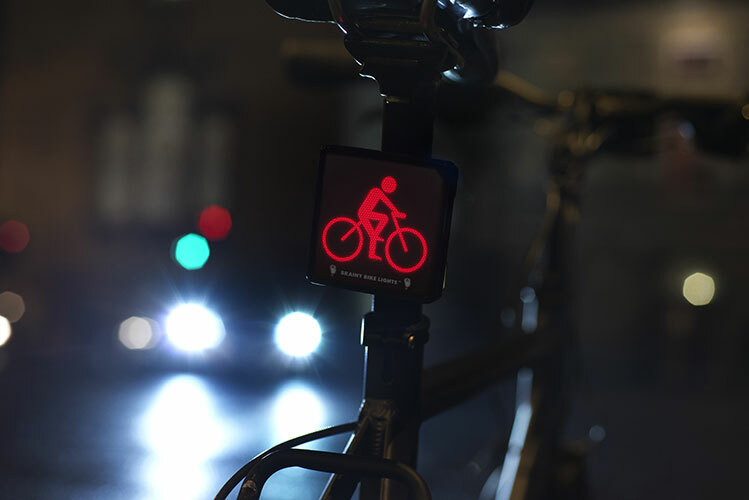 In no event will Brainy Bike Lights’ responsibility exceed the purchase price of the Product giving rise to a claim. Except to the extent prohibited by applicable law, any implied warranties, including that of merchantability or fitness for use or for a particular purpose, are expressly disclaimed. iii. This warranty is not transferable, and shall be null and void in the event of any transfer of ownership of the Product. 2. TO THE MAXIMUM EXTENT PERMITTED BY APPLICABLE LAW, BRAINY BIKE LIGHTS LTD DISCLAIMS AND EXCLUDES ALL OTHER TERMS, CONDITIONS AND WARRANTIES IN RELATION TO THE PRODUCTS AND ANY SERVICES PERFORMED WHETHER EXPRESS OR IMPLIED BY STATUTE OR OTHERWISE OR ARISING FROM ANY PREVIOUS COURSE OF DEALING OR USAGE OR TRADE PRACTICE. How fast can you spot the cyclist symbol light? Take the test. Be informed of all our latest news and offers. Bike Lights | Rear Bike Lights | Front Bike Lights | © Brainy Bike Lights Ltd 2013. All Rights Reserved.